Anh and Susan have been married for more than thirty years. They both retired five years ago after Anh turned 60. Susan was 61. They both held professional careers, but looked forward to retirement. Financially, Anh and Susan have always been quite comfortable. They don’t have children, and own an investment property which is rented out full time. Both have earned super for a large part of their working lives so when it came time to prepare for retirement, they spoke with their Industry SuperFund’s financial planner about how to maximise their income in retirement. With an investment property worth around $500,000 and super balances of $350,000 and $450,000, they wouldn’t have access to the Government Age Pension. However a combination of the rental returns and regular income from their super funds via income streams would be a sensible option. That way, they would receive regular payments and the balances of their Industry SuperFund would continue to grow during the early years of retirement before they gradually draw down on all of it. When they retired, Susan’s super balance was $350,000 and Anh’s super balance was $450,000. They converted their super accounts into income stream accounts with their Industry SuperFunds. When they retired, their investment property was worth around $500,000 with an annual income of on average around $26,300. Over the past five years they withdrew a combined amount of on average around $44,800 each year from their Industry SuperFund income stream accounts. Ahn and Susan were fortunate to retire during a period of high growth with an average five year Industry SuperFund investment return of 10.5%. 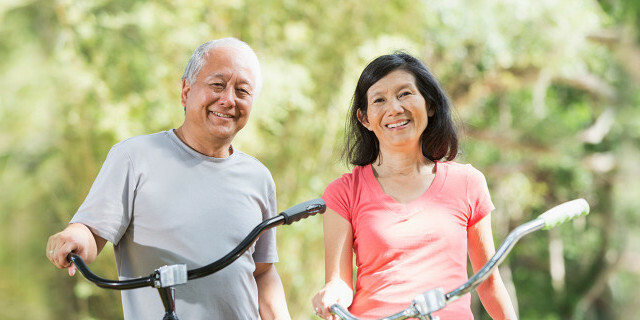 Anh and Susan continue to meet regularly with their Industry SuperFund financial planner to review their options and plan the best way to draw down on their savings throughout retirement. Anh and Susan are not actual members. Their story has been created for illustrative purposes. Modelled outcomes by SuperRatings show 5 year average net benefit results taking into account historical earnings, fees and drawdown amount of 5% p.a. of the main balanced investment options of 16 Industry SuperFunds’ retirement income products during the first 5 years of retirement. Example assumes the average 5 year Industry SuperFund investment return of 10.5% p.a., starting balances of $450,000 and 350,000, starting ages of 60 and 61, home is owned, not eligible for the Age Pension, married, investment property worth $500,000 with 5% yield increasing annually with inflation. Modelling as at 30 June 2018. Capital growth will not continue throughout retirement. Past performance is not a reliable indicator of future performance. Returns may fluctuate over time and can vary significantly from year to year. Outcomes vary between individual funds. Consider a fund’s Product Disclosure Statement (PDS) and your personal financial situation, needs or objectives, which are not accounted for in this information, before making an investment decision. For more details about the SuperRatings modelling see the Assumptions page.